I just want it noted that at no point before the segue was the phrase “the ball in our court” mentioned, in case you thought it didn’t come out of left field. So that was great, but then, of course, Trump stole the show by basically saying “Melania, take this,” and rudely tossing the ball into the front row. Which, as far as I know, may be some kind of huge insult in Russia. He already stumbled around like a buffoon in front of Queen Elizabeth, so he may as well pull a faux pas with Putin too. 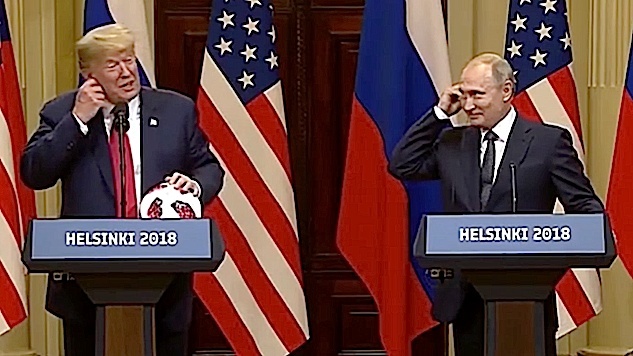 In conclusion, the next version of the Ludovico Technique will involve exposing victims to a buddy cop movie featuring Trump and Putin.